Home › SEO › January 2016 Google Panda, Penguin and Pigeon Algorithm Update Possible? January 2016 Google Panda, Penguin and Pigeon Algorithm Update Possible? An update of the Google algorithm was anticipated for quite a while in the months leading up to July 2015. Predictions about the update were being discussed both on the web and in real life, but nothing was confirmed until Google spokesman Gary Illyes stated that there would be an update of panda. Panda 4.2 was released ten months after Panda 4.1. Its release ended the long wait many websites had endured. However, the rollout of Panda 4.2 was a slow one. Rather than being rolled out in just a few days, the update was introduced slowly over the course of a month. Google stated that this was how the new updates would be released from now on. The search giant is looking to make it a more continuous change rather than a sudden as opposed to a sudden shock. Google provided the public with an estimate on what percentage of queries would be affected by Panda 4.2; approximately 2% and 3%; as opposed to the 3% to 5% affected by the 4.1 update in late 2014. The real question being asked about Panda 4.2 was, “How is this update going to affect search results?” As business owners such as personal injury lawyers, orthodontists and mortgage brokers scrambled to find out how search results would be affected by the update, it soon became clear that there was little effect on search results immediately after the Panda 4.2 update. In reality the update was not much of an update at all. The Panda 4.2 update was more of a refresher to the Panda 4.1 update than anything. Panda 4.2 reapplied the same signals used in Panda 4.1 and some of the same websites were hit and saw an even steeper decline. Those unaffected likely did not see much of a change in overall search traffic on the day the algorithm was updated. Many websites noticed slow gains in traffic throughout the months of July and August in 2015. After August 14th however, the small gains were swept away. Websites that reported that the gains they had accumulated between the release of Panda 4.2 and August 14th had suddenly vanished. Some believe that the sudden reversal of the gains shows that Google may have reversed the update. If this is the case and Google reversed the Panda 4.2 update, what does this mean for the January 2016? Will Google continue to employ their strategy of slow rollouts? Are there more significant updates coming to Panda in 2016? These questions were left unanswered in 2015. Only time will give us a definitive answer to these questions, but we can make some predictions based on what has been observed in previous years. Panda was the lone algorithm to receive an update in 2015. The year of 2015 left us with the question of “what happened to Panda 4.2?” The update lead to gains for about a month then the gains were suddenly gone. Was Panda reversed? Or were reports of reversed results faulty? I believe that the loss in gains was not due to a reversal but instead the opposite. The loss in gains was due to the gradual rolling out of the new update. Google stated that the update would be gradually rolled out over the course of months. After just one month, Panda may have just been getting started. In 2016, I predict that there will be another Panda Update sometime mid year. It will be gradually released. Google stated this would be the new norm for their algorithm updates. I believe the new update will set the bar higher than before. With a new Panda update in 2016 websites will need to step up the quality of their content before the release of the new algorithm. Websites will need to have specific qualities to rank well through the next Panda update. When creating content be sure to keep quality in mind. Prove that you are an expert on the topic and that you can be trusted. If you can do this, your website will rank well in the next Panda update. Just be sure that the revisions/updates to the site are done before the rollout of the update. Once the update has started it will be too late to make changes that will affect rankings. By publishing unique content and building natural links your business website will benefit from any Google algorithm update. After the release of Penguin 3.0 in 2014 it has been stated that the updates would be continuous, meaning that major updates of the Penguin algorithm are a thing of the past and will no longer occur. Instead, there will be constant small adjustments made to the algorithm. The Penguin algorithm was created to prevent websites with artificial backlinks from ranking in Google search. Since there are no real updates to watch out for, there are no real good predictions to be made regarding Penguin. I recommend just sticking to natural backlinks. Don’t try to cheat the system! This algorithm will be working constantly to keep websites with artificial backlinks from taking up space front page in 2016. The goal of Google Pigeon is to bring local results to the attention of the searcher. When you search for goods or services or a type service, Pigeon is what brings up the map with multiple pins highlighting businesses close to your geographic location. The most recent update of Pigeon was released over a year ago on July 24th, 2014. The 2014 update of Pigeon improved the location tracking and put more relevant results “on the map”. Literally, on the map at the top of a search for services. I predict that there will be an update of Pigeon in 2016 but not a traditional update. I believe that the rollout of Pigeon updates will be over the course of multiple months. So if there is an update, its effects may not be noticed for a few months after the release. So how can businesses make sure that they get featured by Pigeon? Businesses ranked by Google Pigeon are ones who have registered their business with Yelp. Pretty simple right? 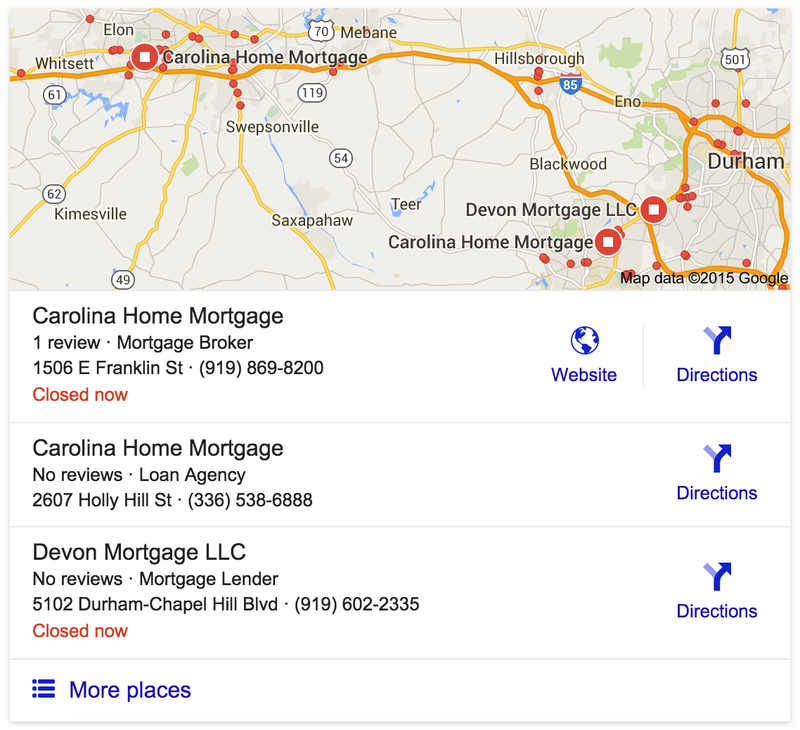 Also note that Google Local map search results only contain three (3) listings now. Getting into this “3-pack” is extremely important for business owners. Based on what has happened over the past years, here is a rundown of my predictions for Google’s algorithms in 2016. Panda should be getting another update in 2016, although the introduction of the update will be slow and changes in results will be gradual. Penguin will continue to be updated, meaning that no major updates will be presented at one time in 2016 but you can expect minor changes over time. Pigeon ranks websites by geographic location as related to the searcher and their presence on review websites include Google My Business, Yelp and others. Pigeon has not received an update in over a year but large updates may not be noticeable due to Google’s new method of rolling out new algorithm updates. I believe Google is moving toward more continuous updates of its Panda, Penguin and Pigeon algorithms without single large updates. Changes in data will occur gradually as opposed to large spikes. If you would like an expert’s help regarding SEO, don’t hesitate to shoot us an email at jesse@wojdylosocialmedia.com and get a monthly SEO package for your website.